One of the best in the Original Design Manufacturer (ODM) Leather Upholstery and furniture market in Malaysia, HU is a market leader that boasts a full range of advanced and diversified business models. Since its successfully exported for the first time to Singapore, the company has been expanding into Australia, New Zealand, Kuwait, Canada, Peru and more than 50 countries across Asia, Europe, Africa, North Amerika and South America continents. Starting from a humble 7,200 sq.ft. factory that first produced upholstered sofas, our Product Research and Design team has expanded our product range following market needs to include dining chairs and bed frames within 8 years. To achieve high productivities and fulfil space demands, the company setup a larger factory, covering a 97,400sq.ft. area with facilities that grew to include an administration office, showrooms, raw material storage rooms beside draw-and-cut sections. Presently, HU owns five factories equipped with different functional facilities, covering the total area of 455,000sq.ft. Our workforce has increased to more than 500 employees, and the number is still growing today. 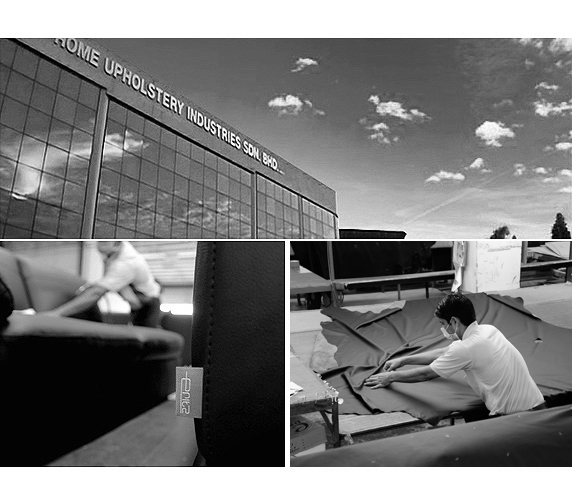 With our escalating biannually sales of USD58.9 million in Financial Year Ended (FYE) 2008/09 to USD80.4 million in FYE 2014/15, HU has been successfully re-positioning our brand to become a leading global player with high competitiveness in the leather upholstery furniture industry. Our products of superior quality are the cumulative results of our vast experience in honing and mastering our skills with substantial information gathered from the industry. HU's innovative and multi-conceptual designs are the ingenious and artful combination of careful selection in leather, different stainless steel and wood material. We never stop looking for the latest updated information to be included in our product technology and design concepts. This way, we keep on trend and stay in line with global needs. Lot 8726, Ptd 6023, Batu 8, Kawasan Perindustrian Bukit Bakri, 84200 Muar, Johor, West Malaysia. Â© 2005 - 2019 eritz.com.my. All rights reserved.